KFB Candid Conversations presents a discussion about the topical issues facing the agricultural industry in a question and answer format with a member of Kentucky’s agricultural community. 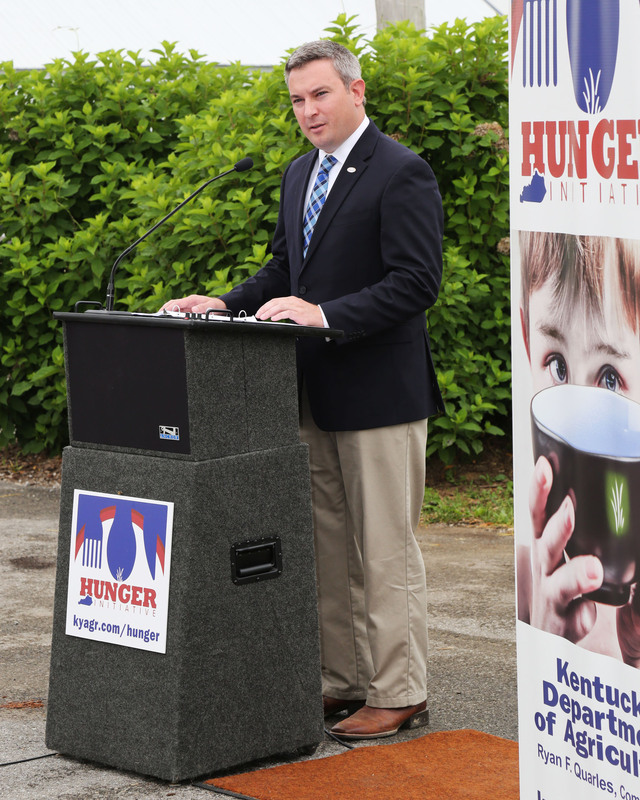 In this column, Kentucky Agriculture Commissioner Ryan Quarles talks about the Hunger Task Force created earlier this year to explore ways to alleviate the issue of food insecurity in this state. Kentucky Farm Bureau Executive Vice-President David Beck is a member of that Task Force. What prompted you to begin this imitative at KDA? As an FFA member in high school, every year our big project was a food drive conducted around Thanksgiving. The FFA chapter would challenge each home room to collect food so I grew up being exposed to the issue of hunger in Kentucky. While serving in the Kentucky Legislature, I was very supportive of the Farms to Food Banks Trust Fund and learned more about the tax credits available to farmers. As I traveled the state in 2015, I saw that hunger is an issue that affects every community, every county, every hometown and every main street in the Commonwealth. As Agriculture Commissioner, I felt that, coming from a state with a strong farming economy, we could do a better job from the farmer-up level. Partnering with the Kentucky Food Banks Association we developed the Kentucky Hunger Initiative as a unique and first-of-its-kind effort to address an issue that unfortunately affects one in six Kentuckians and one in five Kentucky school children. What prompted me to dedicate KDA’s time to this major issue was compassion; I feel the farm community can play a more active role; and KDA already acts as the intersection between consumers and the farm world so I felt we could facilitate this discussion. Do you think most people don't realize there is a hunger issue in Kentucky? Absolutely. Most Kentuckians don’t realize how many people food insecurity affects but it’s an unfortunate reality. This is not an issue that affects just rural Kentucky or parts of the state that are suffering from high unemployment, there are food insecurity issues in the most affluent neighborhoods in Kentucky. Hunger is such a complex issue that there are stigmas attached to those affected by it and unlike other issues affecting a large percentage of the population, hunger is often one that’s often hidden; it’s one that unfortunately affects vulnerable populations such as children and the elderly more and it’s one that’s really hard to generalize because there are many different faces of hunger. I even have legislators who are surprised to learn of how big of a problem it is in their own districts. Since the Hunger Task Force began its work, is there anything that has come about from the group that stands out to you? We have had standing room only Hunger Initiative regional meetings which have been very encouraging. Some of the solutions that have been identified as parts of our recommendations are ones that I think most Kentuckians can get behind whether that’s a backpack program to put food in school children’s’ backpacks on a Friday so they can come back ready to learn on a Monday without an empty stomach, to gardening efforts to perhaps partnering with our corrections systems to have those who are rehabilitating their life grow food for those in need. And of course the best investment we can make is to continue to support the Farms to Food Banks Trust Fund where food that would otherwise rot in the field is harvested and provided to the food banks. The benefit of the Trust Fund is that it benefits Kentucky agriculture and producers while we put high quality Kentucky food into the hands of those who need it the most. The most surprising part of this initiative so far is to see how many Kentuckians want to a part of the solution. The agriculture industry seems like a natural choice to help combat hunger issues. Could you elaborate on that? We are blessed in Kentucky to have a compassionate farm community. We have many strong agricultural organizations such as Farm Bureau, commodity groups or livestock organizations. And all of them have a similar approach to this issue that as farmers, we’re already feeding the world and we can do a better job of helping those in our backyard when it comes to solving hunger. I feel that if we have an approach that involves those farmers who put the seed in the ground to the grocery stores to our food banks and restaurants where 40 percent of all the prepared food goes in the trashcan; if we include our charitable community and even our church community as well as our researchers in higher education, that we can identify some tangible, pragmatic solutions. Whether that be changes in regulations where it would make it easier for grocery stores to donate produce, or create a network of thousands of organizations that currently have some sort of anti-hunger initiative to get them connected perhaps through a better communications tool, KDA is best to facilitate this discussion because we already represent a farm community that often puts an emphasis on helping your fellow neighbor. How important is it to bring all of these organizations together to help with this issue? Hunger is such a devastating issues that affects so many Kentuckians that we need to have a collaboration of entrusted organizations, be it a church in downtown Louisville, a non-profit in rural Kentucky or establish agricultural organizations. But we can all do a better job of working together. Often, we have identified duplication in the system which has caused resources to needlessly be spent and other times we found there may be two organizations in the same town that aren’t aware of each other’s presence. It’s important that we take an inventory of what’s working well, identify those areas that have a void and come up with recommendations that can be applied on a regional basis across the state. What is the main goal of the Task Force and how hopeful are you this goal will be realized? As we conclude our 10 regional meetings, the Hunger Task Force is to develop a statewide strategic plan to better address hunger in the state. And we took time to listen to the needs of Kentucky because we realize it’s a regional state and a one size fits all solution more than likely will not work. So, we want to make sure that we develop pragmatic, practical solutions that are a tailored fit to the regions of Kentucky. What may work in downtown Louisville may not work in deep Eastern Kentucky. We need to identify what we can do better, but also provide metrics so we can figure out, during my term as agriculture commissioner, what areas we can best invest in. We believe what’s happening in Kentucky can be replicated in other states. The next meeting of the Hunger Task Force will be November 22, at the Kentucky Department of Agriculture. For more information, go to http://www.kyagr.com/hunger.